As Occupy Atlanta entered its second week, I decided to see for myself what was going on at Woodruff Park. With my three-year-old daughter in tow, I set out for downtown Atlanta to find out if the local occupiers were as rowdy as the Occupy Wall Street crowd in New York. My first brush with the activists occurred as I was driving down Peachtree St. toward Woodruff Park. Appropriately enough, as I approached Peachtree and Wall St., I heard drums and saw marchers parading up the sidewalk, accompanied by a bicyclist who was somewhat reminiscent of Grizzly Adams. I snapped a couple of pictures as they passed by and then continued toward the main encampment. Woodruff Park, a small green space located in the midst of downtown Atlanta, was mostly quiet early in the afternoon. As I approached, the site of scores of tents was contrasted with a light jazz music that seemed to be emanating from speakers around the park. The activists, who probably numbered between one and two hundred, were almost equaled by curiosity seekers and locals enjoying the tables by the fountains or playing chess with oversized pieces. There were also a number of people who appeared to be homeless and may or may not have been connected with the occupiers. A large tent at the entrance to the park beckoned visitors. Another sign proclaimed the rules: “Love everybody, no alcohol, no drugs, [and] no weapons.” An American flag fluttered in a tree behind the welcome tent. Other facilities including a tent offering free child care, a first aid tent with a sign on the adjacent trash can warning “do not pick from this trash can it is right by the medic station.” A “free store” was a large tarp in the center of the encampment with a few clothing items arrayed. Wal-mart, it wasn’t. In contrast to reports from other cities, Woodruff Park was not covered with litter. There were protest signs scattered on the ground, but the area seemed clean otherwise. A number of porta-potties were set up on a street beside the park. Police officers and downtown ambassadors, both of which were present in force, said that the protesters had not caused any trouble. There seemed to be relatively few activists around. Many were sleeping or lounging in the shade. One played plastic bucket drums. On the other side of the park, another activist painted designs on more bucket drums. One small group sat under the trees listening to a young man strum a guitar. Few seemed to pay attention to the sight-seers wandering in their midst. One of the first activists that I spoke with was a black Marine Corps veteran. He offered one of the few concrete reasons for taking part in the protest. He was upset that his mortgage rate was over seven percent after Congress had given trillions of dollars to bail out Wall St. investment firms and provide capital for banks. Even after President Obama’s mortgage modification program was enacted, the man had still not been able to get his loan refinanced in spite of being charged numerous fees to apply for a new loan. One man, Logan, held a sandwich board that read, “Close your account now.” I asked what he suggested that people do with their money after they closed their accounts. “Try a credit union,” he suggested. That’s hardly radical. I am a longtime credit union member myself. Mainstream consumer activists like Clark Howard and Dave Ramsey would probably approve as well. Another sign that the activists were not totally sour on corporations and capitalism was the presence of an ice cream vendor just outside the encampment. Although not exactly doing a brisk business on the pleasant afternoon, Bo, the operator of the stand, said that the occupiers were friendly and recognized that he worked for a small, local company. One might wonder how big and successful or in how many cities a company must be before it becomes evil and greedy. Signs hinted at a smattering of progressive causes. A hand-lettered sign proclaimed the park to be “Troy Davis Park,” a reference to the convicted cop-killer executed by Georgia recently. Another sign said “MARTA cop killed Joetavius Stafford.” Yet another decries “four years of education [and] ten years of debt.” Anti-war messages were sprinkled throughout the encampment, as were signs requesting donations. A tall, black man who wore a paramilitary uniform drew my attention. I recorded a video of him talking to several people and explaining what the activists believe. Later, he said that his name was Wilgeens Rosenberg. Rosenberg said that he was general in Haiti Sovereignty Initiative, which opposes U.S. and U.N. involvement in Haiti. Indeed, a common thread among all the activists was an isolationist bent, opposing the war in Iraq and Afghanistan as well. The activists were not campaigning for Obama. In fact, most of them seemed to feel disappointed in President Obama. They were aware of Obama’s numerous connections to Wall St., and did not seem placated by his health care reform, which was not even mentioned. To my surprise, more often than not they expressed interest in Republican candidates for president in 2012. In particular, several seemed interested in Ron Paul and Herman Cain. I only witnessed one altercation while at the encampment. This was between a conservative visitor and another man who identified himself as a Democrat. Much of the exchange was captured on video. Even this was not violent, but merely a spirited discussion. 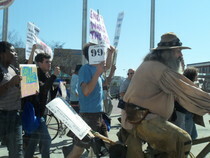 On economic issues, the activists at Occupy Atlanta seem to hold views similar to the Tea Party. On social issues they remain left of center, which probably explains the fascination with Ron Paul. Paul melds conservative economics with libertarian social policies, which are similar to leftist positions in many cases. By and large, the occupiers are not a pro-Democratic Party group. Their existence is symptomatic of the failure of the president’s policies to resolve the economic crisis. While they are a left-leaning group, many of them seem open to new ideas and new faces. Even though many, perhaps most, of the occupiers will vote Democratic, the occupation movement signals dissatisfaction among the Democratic base and is a harbinger for the party of problems to come.